We have seen how we can solve Euler's equations to determine the properties of a rotating body in the co-rotating body frame. Let us now investigate how we can determine the same properties in the inertial fixed frame. The fixed frame and the body frame share the same origin. Hence, we can transform from one to the other by means of an appropriate rotation of our coordinate axes. In general, if we restrict ourselves to rotations about one of the Cartesian axes, three successive rotations are required to transform the fixed frame into the body frame. There are, in fact, many different ways to combined three successive rotations in order to achieve this goal. In the following, we shall describe the most widely used method, which is due to Euler. Clearly, is the precession rate about the -axis, as seen in the fixed frame. Clearly, is minus the precession rate about the -axis, as seen in the body frame. 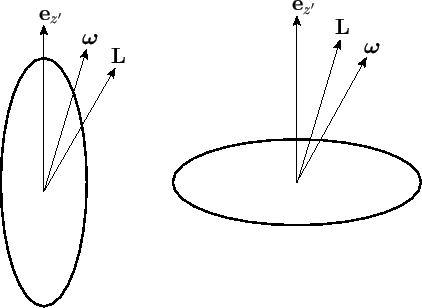 Figure: A freely rotating object that is elongated along its axis of symmetry, (left), and a freely rotating object that is flattened along its axis of symmetry (right). The vector is fixed.